All of these topics are very interesting from a security perspective. However, in this blog post we will solely focus on Direct Boot. There are apps, which should be available directly after booting the device. 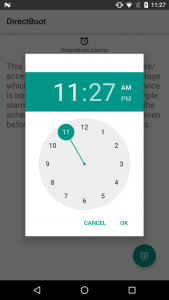 A good example is already provided in the Android examples – the alarm app . Imagine you prepare an alarm to wake up earlier next morning (e.g. to not miss Swiss Cyber Storm). Unfortunately, the device crashes in the night and you would be late on the event, because after restarting the device it remains locked, requiring the passcode for the full-disk encryption. This is, where Direct Boot comes into play. Direct Boot allows encrypted devices to boot straight to the lock screen (Keyguard is also Direct Boot aware). 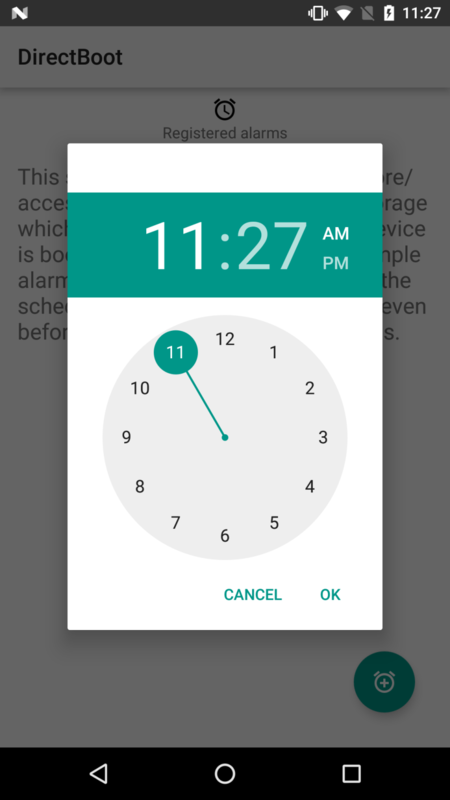 Therefore, the alarm will still be triggered after the reboot in Android Nougat. 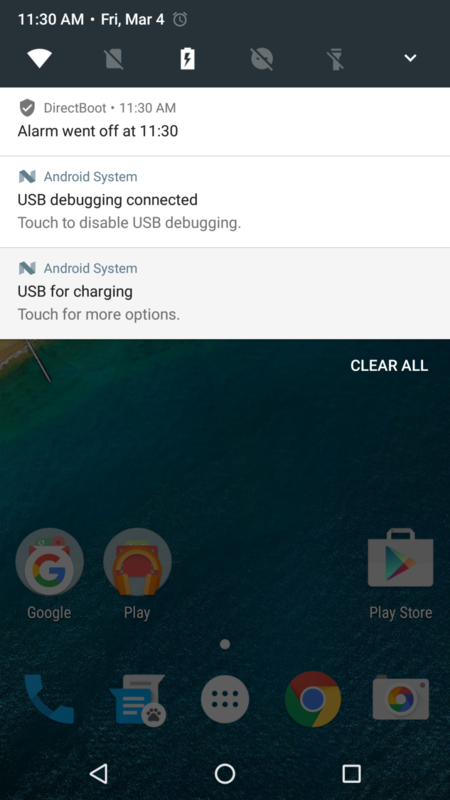 Since the Android Compatibility Definition Document (CDD) for Nougat is not officially released yet, we can only speculate whether the document will change the STRONGLY RECOMMENDED to REQUIRED requirement for TEE. As it is likely to happen though, let us assume TEE is required. The Trusted Execution Environment (TEE) is ARM’s TrustZone for popular mobile devices. TEE establishes a trusted environment, which is separated from the untrusted Android environment and its OS. This concept is very similar to the iOS security enclave, where the regular OS and components cannot access the protected memory directly. The same principle applies for the TrustZone / TEE. Note that there are are a few differences in its implementation, e.g. Android does not require a fully isolated core. TEE can be used to store various secure applications similar to smart cards (JavaCard applications). In the context of Android such a secure application is the KeyMaster, where keys are stored securely and crypto-operations take place. Therefore, the untrusted zone can not access the private keys. Full-disk encryption is used to protect the internal and external memory (SD-card). An appreciated property is that the used key material for full-disk encryption is bound to the hardware. As you already expected, TEE is used to bind the scheme to the hardware. Additionally, the user has to provide a passphrase, which is also added to the full-disk encryption scheme in order to prevent attacks from a locked mobile device. Both aspects appear as M1 – Improper Platform Usage and M2 – Insecure Data Storage in the OWASP Mobile Top Ten 2016 . 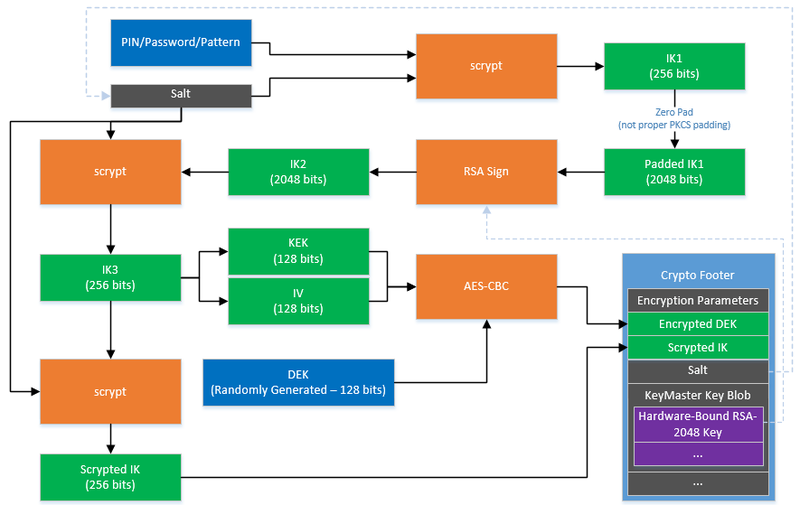 Since they are ranked as the two most frequently occurring security issues, we will probably see these application specific vulnerabilities in the context of Direct Boot in the near future. App developers need to carefully plan where to store data. Confidential and user-specific data should never be stored in the DE storage. Migration of data from CE to DE storage has to be thoroughly analyzed and file permissions set as restrictive as possible.